The Global Volcanism Program has no activity reports for Santiago. The Global Volcanism Program has no Weekly Reports available for Santiago. The Global Volcanism Program has no Bulletin Reports available for Santiago. 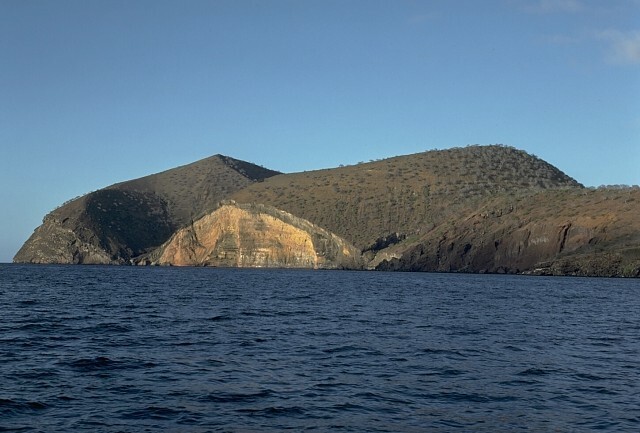 The elongated shield volcano of Santiago Island, also known as San Salvador Island or James Island, is dotted with Holocene pyroclastic cones. Fresh-looking lava flows from these cones blanket the flanks. 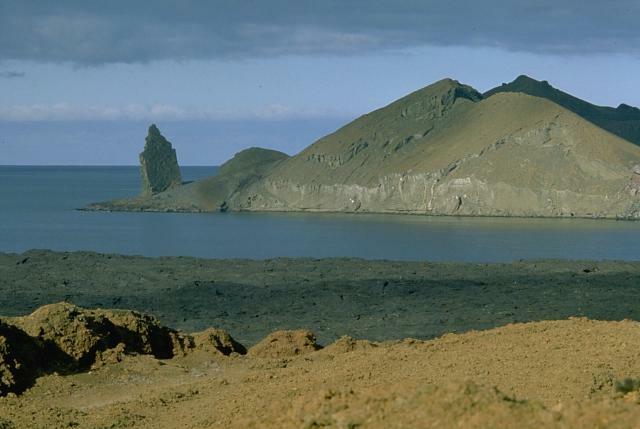 The summit ridge, lined with a chain of NW-trending cinder and spatter cones, is located at the NW end of the island. Prominent flank tuff cones occur at the western and eastern coasts. The most recent activity has been concentrated at the NW and SE ends of the island. The spectacular pahoehoe lava flows at James and Sullivan Bays, on opposite ends of the island, were erupted during historical time. The James Bay flows were dated by fragments of marmalade pots left by buccaneers in 1684 that were subsequently embedded in the lava flows described by Charles Darwin in 1835. Swanson F J, Baitis H W, Lexa J, Dymond J, 1974. Geology of Santiago, Rabida, and Pinzon Islands, Galapagos. Geol Soc Amer Bull, 85: 1803-1810. There is no Deformation History data available for Santiago. There is no Emissions History data available for Santiago. A spectacular suite of volcanic features flanks Sullivan Bay, at the eastern end of Santiago Island. This view looks NE across the bay to Bartolomé Island. The sharp pinnacle at the left, a remnant of an eroded tuff cone, is one of the many scenic highlights of the Galápagos Islands. Bartolomé Island contains eroded tuff cones, a dissected solidified lava lake, and a youthful lava plateau. The flat coastline of Santiago Island in the foreground is formed from a vast field of youthful pahoehoe lava flows that wraps around the SE corner of the island. 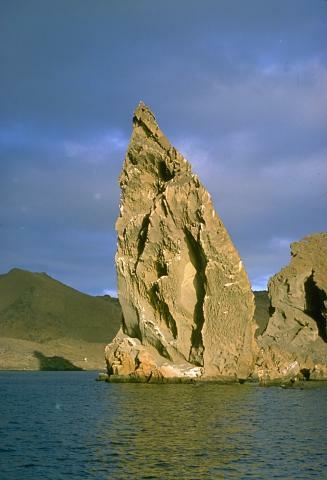 This prominent pinnacle is an eroded remnant of a tuff cone on Bartolomé Island, off the east coast of Santiago Island. A wide variety of volcanic features flanks Sullivan Bay, one of the most visited boat anchorages in the Galápagos Islands. These include tuff cones and cinder cones, a dissected solidifed lava lake, and vast fields of youthful pahoehoe lava flows. 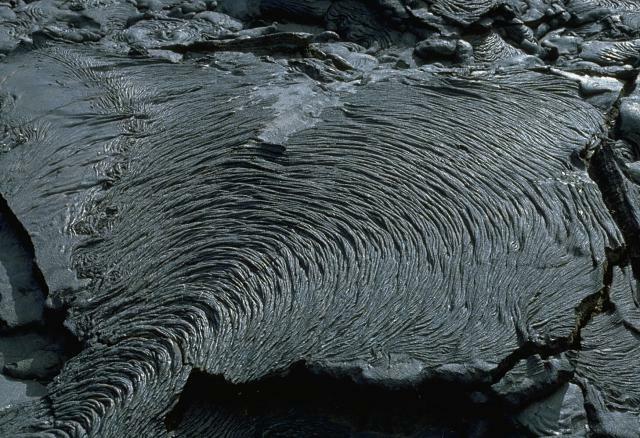 The ropy texture of pahoehoe lava flows is produced when the thin solidified surface of the flow is pushed by the advancing, still-molten interior. 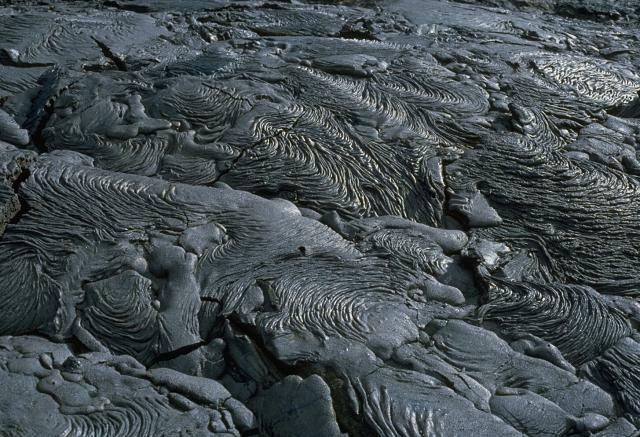 This pleated pahoehoe lobe, on a lava flow at Santiago shield volcano in the Galápagos Islands, advanced slowly from the bottom right to the upper left. Pahoehoe lavas are the least viscous of common lava types, and thus form spectacular surface structures. An extensive field of spectacular pahoehoe lava flows is located near Sullivan Bay on Santiago Island. The fresh, sparsely vegetated flows cover an area of more than 50 sq km along the SE coast of the island. Eruptions occurred at SE Santiago in 1897 and 1904-06. A small lava shield 3.5 km inland from Cabo Trenton on the SE tip of the island was the principal vent of these flows. The elongated shield volcano of Santiago Island is dotted with Holocene pyroclastic cones. Fresh lava flows that blanket the flanks of the volcano originated from these cones. The 920-m-high summit ridge, lined with NW-trending cinder and spatter cones, is seen here from James Bay on the west side of the island. 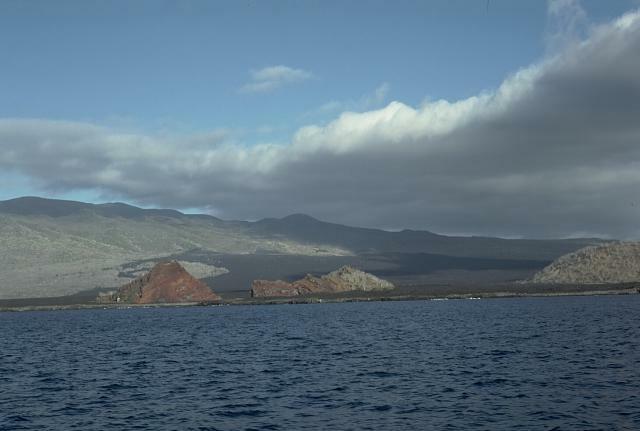 The James Bay lava flows (center) reached the coast along a broad front. They were dated by fragments of marmalade pots left by buccaneers in 1684 that were subsequently embedded in the lava flows observed by Charles Darwin in 1835. 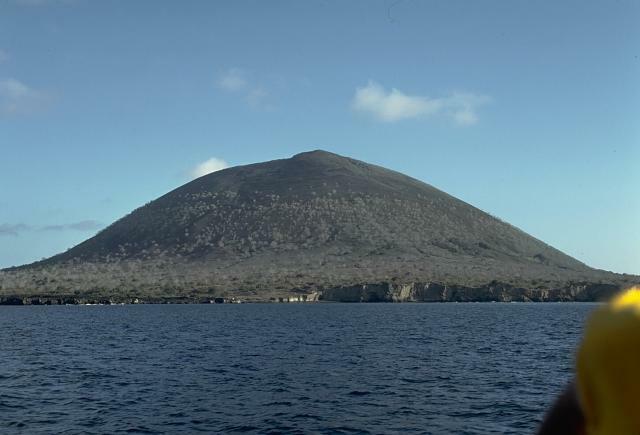 An unnamed 394-m-high cinder cone is a prominent landmark near James Bay at the western end of Santiago Island. The eruptions that constructed the cone were initially submarine, producing palagonitic tuffs. As the cone grew above sea level, subaerial explosions produced basaltic scoria that forms the upper part of the cone. A similar, but smaller cone lies immediately to the SE, out of view to the right. The Global Volcanism Program has no maps available for Santiago. Large Eruptions of Santiago Information about large Quaternary eruptions (VEI >= 4) is cataloged in the Large Magnitude Explosive Volcanic Eruptions (LaMEVE) database of the Volcano Global Risk Identification and Analysis Project (VOGRIPA).